Daysland Daysland's logo is the unique Prairie Crocus, a symbol of the beautiful Alberta Prairies. Daysland is located 40 km southeast of Camrose on Highway 13. 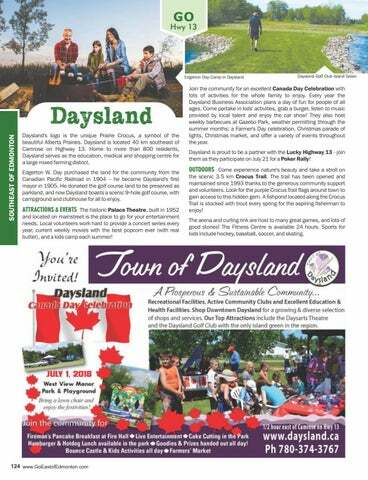 Home to more than 800 residents, Daysland serves as the education, medical and shopping centre for a large mixed farming district. Edgerton W. Day purchased the land for the community from the Canadian Pacific Railroad in 1904 â&#x20AC;&#x201C; he became Daysland's first mayor in 1905. He donated the golf course land to be preserved as parkland, and now Daysland boasts a scenic 9-hole golf course, with campground and clubhouse for all to enjoy. ATTRACTIONS & EVENTS The historic Palace Theatre, built in 1952 and located on mainstreet is the place to go for your entertainment needs. Local volunteers work hard to provide a concert series every year, current weekly movies with the best popcorn ever (with real butter), and a kids camp each summer! Join the community for an excellent Canada Day Celebration with lots of activities for the whole family to enjoy. Every year the Daysland Business Association plans a day of fun for people of all ages. Come partake in kids' activities, grab a burger, listen to music provided by local talent and enjoy the car show! They also host weekly barbecues at Gazebo Park, weather permitting through the summer months; a Farmer's Day celebration, Christmas parade of lights, Christmas market, and offer a variety of events throughout the year. Daysland is proud to be a partner with the Lucky Highway 13 - join them as they participate on July 21 for a Poker Rally! OUTDOORS Come experience nature's beauty and take a stroll on the scenic 3.5 km Crocus Trail. The trail has been opened and maintained since 1993 thanks to the generous community support and volunteers. Look for the purple Crocus Trail flags around town to gain access to this hidden gem. A fishpond located along the Crocus Trail is stocked with trout every spring for the aspiring fisherman to enjoy! The arena and curling rink are host to many great games, and lots of good stories! The Fitness Centre is available 24 hours. Sports for kids include hockey, baseball, soccer, and skating.